Well the wait is finally over! The first of the ripe figs were ready for picking this week. 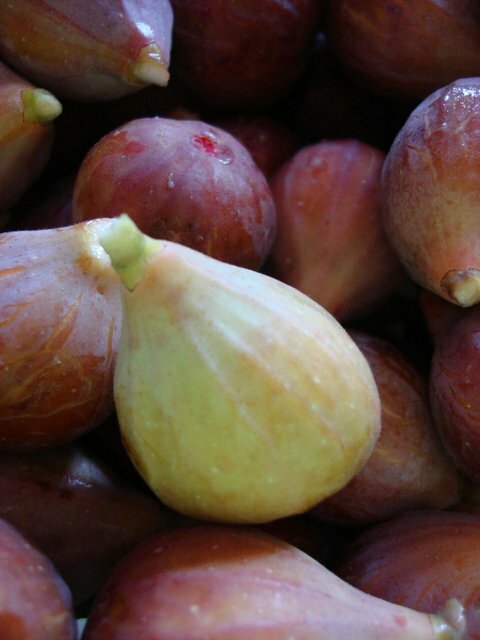 I plan on making some of them into the chutney I made last year but I wanted to make a few jars of just plain fig preserves with some of these figs. Yes, these preserves taste great slathered on toast or a biscuit but they can be used is so many ways that I'm thinking I'm going to make another batch before fig season ends. Figs and cheese are a natural pair, imagine topping a round of brie with the preserves and baking it until the brie is warm and melty...drool! Spread the preserves in a pre-baked tart shell to make the base of a great fresh fig tart. Add some to some balsamic vinegar and olive oil to make a killer fig vinaigrette. Use the preserves to fill thumb print cookies or homemade fig newtons. I could go on and on. This recipe is so easy that making several batches of preserves will be almost as easy as making them disappear! In a large pot, layer the figs with the sugar and the lemon zest. Pour the lemon juice over the figs and sugar. Let the pot stand for 8-12 hours at room temperature, until most of the sugar is dissolved. Next place the pot over medium-low heat. Cook the figs, stirring gently only a few times. Cook the preserves until the figs are partially translucent and the syrup has begun to thicken. About 30-40 minutes. Ladle the preserves into sterilized pint or half pint mason jars. Add lids and rings and process the jars for 10 minutes in a boiling water bath. Go here for a guide for home processing fruit. *The recipe says it yields 2 1/2 pints. I got 3 half pints of preserves. I have been waiting patiently for figs in our local market. Figs are my favorite, but I have tried time and time again to get a tree to grow. Those look SO delicious! !